Not sure what numbers to choose for the next UK Lotto draw? 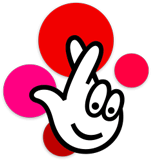 Get your numbers generated by our trusted lotto number generator. A single click on the green button „Generate numbers“ will generate you up to ten lines of numbers within a couple of seconds. The generator is available for free allowing each player repeating the selections as they like. We wish you best of luck in hunting the jackpot of your dreams. Tip for you: Set the generator at 10 lines, hover the cursor over „Generate numbers“ and shut your eyes. Imagine what things you could buy if you won a jackpot. Press the button and count one, two…until fifteen. Open your eyes and intuitively pick one combination from the generated numbers. The number combination that first catches your eye is probably the lucky one.